We live in what might be called a prodigal son delusion. People suffer from the temptation to live prodigal lifestyles in which they engage in the frenetic intemperance of demanding everything instantly and effortlessly. Such a state promises happiness to those who follow the program to the end. However, it does not always deliver what is promised. Indeed, we live in prodigal times. They are lavish, intemperate and prosperous. This prosperity is not an illusion. It exists. There is plenty of economic good news that is constantly repeated. Unemployment is down. The economy is booming again. Jobs are available to all who want them. Production is up everywhere. There is plenty of money around. Socialist regulations are being repealed. There is nothing wrong with jobs, increased production and prosperity. We need a certain amount of abundance for a life of virtue. For if people constantly need things as seen in Cuba or Venezuela, they will be tempted to steal, lie, cheat and sin to survive. Virtue and absolute misery are incompatible. Our problem is not abundance but prodigality — reckless habits that lead not to happiness, but to misery. We are obsessed with money and spending. Too many people reduce everything to money, jobs and frenetic economic progress. Too few worry about moral values — the real source of stable progress. By all the metrics of prodigality, happy times should be here again. But they’re not. And the problem is not material happiness — it’s spiritual. Our problem is being prodigals. And there is plenty of that going on. The good news is that the economy is up. The bad news is we are spending lavishly — a lot of it is on our credit cards. Personal household debt has now inched back up to over $13 trillion, and the national debt approaches $22 trillion. Our national deficit this year will be around a trillion dollars. Next year, interest alone on the national debt will be $390 billion. Corporate debt is at record levels. World debt levels are at $169 trillion. For now, we are swimming in money — even if a lot of it belongs to lenders. By all the metrics of prodigality, we should be happy. Happy times should be here again, but they’re not. And the problem is not material happiness — it’s spiritual. A Gallup poll of 2.5 million Americans claims “subjective well-being,” or happiness, is down everywhere. 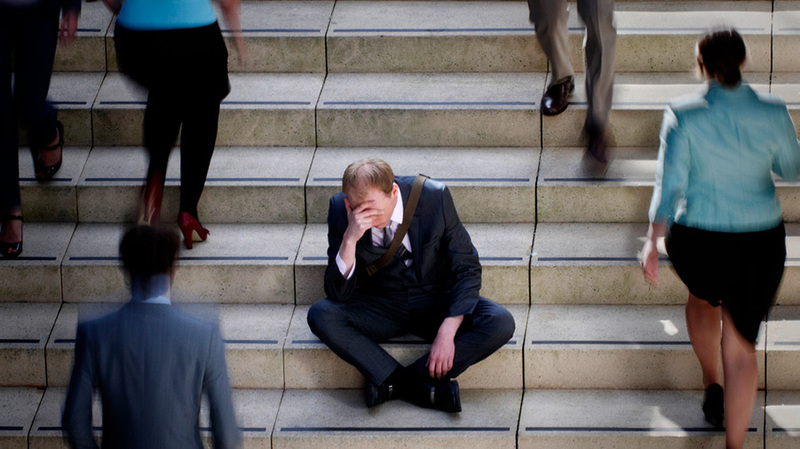 People may have jobs and money, but they are worried, depressed and polarized. The 2018 “happiness” study showed not a single state registered a statistically significant improvement in well-being in 2017. Overall, America registered its largest year-to-year drop in the ten years since Gallup has tracked happiness trends. Among the reasons cited for unhappiness were increased depression, daily physical pain, and constant worries. People also reported declining support of family and friends and dissatisfaction with their standard of living. This unhappiness appears to be everywhere. Higher levels of wealth and education do not appear to make a difference. In fact, according to the study, people were happier immediately after the 2008 subprime mortgage crisis than they are today. Money and jobs do not always mean happiness. Happy times are not here again. These pollsters measure everything. Not only is there a happiness survey but there is also a misery index. A new Gallup poll of 154,000 people in more than 145 countries shows that the number of those unhappy, stressed or lonely has reached its highest point on record worldwide. America is one of those at the top of the list. They say misery loves company. Well, much of the world keeps us company. Not only do they measure misery but they also measure loneliness. It’s ironic. We are the most technologically connected nation in history. Moreover, the rates of loneliness have doubled since the eighties. Even more tragic is that the most tech-savvy generation, Generation Z, those born after 1996, is the loneliest sector in America today. Other studies and surveys can be mentioned. In addition to misery, low happiness, and epidemic loneliness, there are reports of a friendship crisis, a stress catastrophe, and even low fertility rates. They all come to the same conclusion. Despite all appearance to the contrary, a lot of people are miserable out there. Thus, we live in prodigal times but are not necessarily happy times. For true and lasting happiness, we need to cultivate gratitude to God for the bounty we enjoy. And in a a prodigal age, that means temperance and self-restraint.